Conflict between the Australian Trucking Association (ATA) and the Transport Workers Union (TWU) shows no signs of abating, with a dispute about approaches to safety spilling over into criticisms of how the peak trucking association – of which the union is a member – is conducting its election voting process. Most recently, the TWU denounced what it perceived to be a lack of information and publicity from the ATA ahead of its general council elections, claiming this is potentially catching willing participants off guard over the holiday period and reducing the number of voters. The TWU notes that despite the first online election of 2017, which should have had the effect of simplifying the voting process and increasing participation, registrations were actually lower than the previous election in 2015, with only 76 truck drivers registering and 56 voting. The TWU then criticises the ATA for publicising the voter registration period just three weeks before it closes on January 31, 2019 – despite a written ATA response to the TWU that the registration period had actually been open since July 2017. In written correspondence with the union, the ATA acknowledges the drop in numbers was a concern and prompted strategies to increase participation, including retaining the registrations of participants from one election cycle to the next, and various digital and social promotions. That does not seem to appease the TWU, which released a public statement outlining its criticisms. "What the ATA is doing is shameful. It has conducted its elections in a vacuum of information, failing to tell drivers they could have registered at any time to vote over the past year and a half," TWU acting national secretary Nick McIntosh says. "Now with just a few weeks to go before voter registration closes and most drivers on annual leave, there is a potential for even less drivers to participate in this election. "This is further proof of the misguided direction that the ATA is going in. "We believe the ATA is deliberately conducting its council elections in a bubble in order to stop genuine independent voices from getting elected. "It does not want dissenting voices that will hold it to account for opposing a system that was delivering 30-day payments to owner drivers and for refusing to commit to binding standards to address the financial strain on our industry that stems from low cost contracts dictated by major clients. "This financial strain leads to high numbers of insolvencies and high numbers of deaths and injuries precipitated by poor maintenance of trucks and drivers pushed to work long hours, speed and skip their rest breaks." 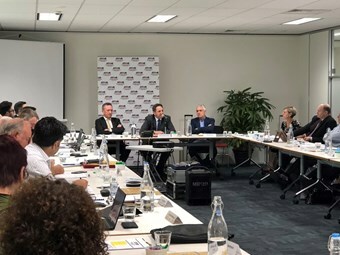 While the ATA is yet to publicly respond to those claims, hostility between the two bodies was reignited earlier this year, despite what seemed to an offering of an olive branch in November 2018 when TWU national secretary Michael Kaine appeared the ATA general council. There, he outlined the union’s approach to safety, including a vision for a revamped Safe Rates system. This was, however, followed by TWU claims in an Owner//Driver column that neither the ATA nor NatRoad had "come on board" with the union’s ideas. "They don’t want to accept how a Safe Rates system will give much needed relief to transport operators by holding wealthy clients to account," Kaine writes. "They don’t want to accept how much more sustainable, safer and fairer our industry will be. "They also don’t want to accept the role they played in making our industry worse: by tearing down an Order guaranteeing 30-day payments to owner-drivers and along with it an application to extend this guarantee to all transport operators. "They don’t want to accept that they have done not one thing to make our industry better in the last three years." That last line in particular drew the ire of ATA CEO Ben Maguire, who emphatically rejected those claims, saying he was "disappointed, but not surprised" by the TWU provocation. "At our council meeting, Michael Kaine admitted that he was deliberately ‘stirring the pot’ – his words – because there was no other way of achieving the results he wants. He said he would keep doing it," Maguire says. "It’s time for the TWU to stop the silly games and make a genuine attempt to work together as we are so willing to do. "There are many examples in the past six months where the ATA and TWU have worked together. "We met with them twice in October and had the goodwill to invite them to speak at our November council meeting. "Prior to Christmas, I also attended the ALP National Conference and was eagerly invited by senator Glenn Sterle to join the Road Safety Remuneration Tribunal working group." Maguire contends that, following the November council meeting, the ATA wrote to Kaine, expressing interest in continuing discussions and working together to advance the industry’s safety. However, "He [Kaine] hasn’t bothered responding, because the TWU clearly doesn’t care about good process or the details of policy development. "It’s time for cool heads to prevail as we get serious about safety, our industry and its economic impact on our nation. Name calling and gamesmanship at these junctures are unhelpful to the greater cause. "The ATA is committed to improving safety and professionalism in the trucking industry and has achieved many important results over the years."